Pronunciation is not a strength of mine. This weakness is also creates an area of annoyance. I do alright with the English language and even better with “American”. But French and other languages I have never had any education in are a bit intimidating. Not because I am afraid to try but because I dread the smugness of people who are not content to correct like a coach but prefer to highlight the error like a superior. I respect the culinary gifts the French have given us but I dread their romance language and it’s effect on my Anglo-Saxon Tongue. When given an opportunity to use a term, I freeze, think of the two ways the term might be pronounced and pick the wrong one every time. Such is the case for those little fried balls of dough with the French name from New Orleans that those that are better than I would pronounce Beignets. Some might offer the substitute phraseology of donut instead but the silent rage that would produce in the Dining Duder would not be worth the deferred embarrassment of using an alternate term. That was the wind-up, here is the tip. There may be a handful of places in town that do beignets. The one I know and go to is Creole Kitchen. A mere $3 gets you a styrofoam clamshell full of these great balls of desire with a side cup of powdered sugar. My advice is eat them instantly in your car while they are steaming hot and the heat is still high enough to melt the sugar into the dough. Simple, good and cheap – hard to beat. This entry was posted on April 24, 2013 at 11:37 PM	and is filed under breakfast. Tagged: Beignets, Creole Kitchen. You can follow any responses to this entry through the RSS 2.0 feed. You can leave a response, or trackback from your own site. My wife and I spent our honeymoon in New Orleans last summer (and have a return trip scheduled for our anniversary), and one of the highlights for me was the multiple stops at Cafe du Monde for fresh beignets…about $3 for a paper bag of donutty goodness with a heaping helping of confectioners’ sugar on top, eaten hot while walking through the French Market. Loved them so much I bought a box of their beignet mix to bring home! 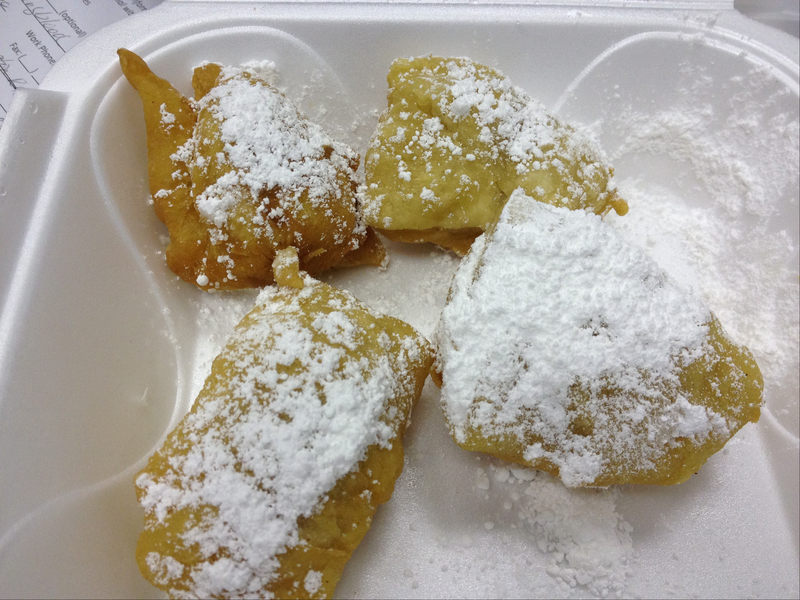 Haven’t had the beignets from Creole Kitchen yet, but they just made my culinary “to-do” list!